What Can We Do To Change Climate Change? 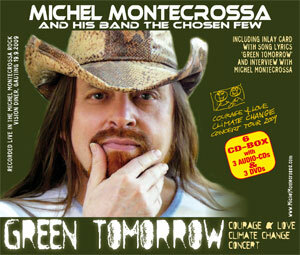 “Written when a monster typhoon hit the Philippines and tornados hit the U.S.A., sending the ultimate climate change warning to every government and to every climate change conference, my New-Topical-Song ‘What Can We Do To Change The Climate Change?’ is singing: We must do the right thing for the future of the earth before it is too late. “The song ‘Talking Climate Change In Daily Life’ was written at the time of the Atlanta snow storm debacle as the cold signal that climate change finally has reached our daily life. A debacle of climate change that will more and more hit the mega cities around the world in many ways from heat waves to deep freeze, from earthquakes to storms and more. The grim reality crisis of climate change is not only ecological, but very soon becomes an economic crisis, a humanitarian crisis, a social crisis and a spiritual crisis. 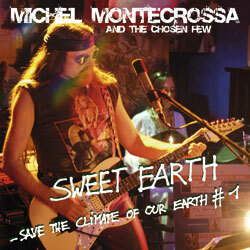 “This song is about adapting to a rapidly changing earth. There are worlds related to our body – food, housing, money. There are worlds related to our soul – love, light, consciousness. When food is only for the rich and houses have no water then money takes the place of our soul. rich with water, sun, wind and earth, / rich with forests and biodiversity, / rich with children, healthy and full of life, / rich with climate change for the better. The energy of the future is renewable, / not radioactive and incalculable. 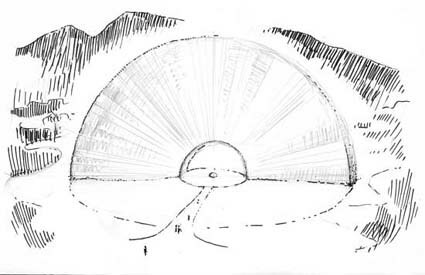 / The economy of the future is solar and transparent / like water without poison and pure air for breathing. 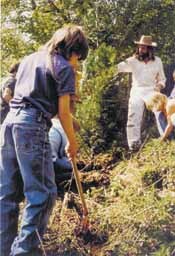 Investing in the future of the earth / is for our youth the best heritage. / Green future secures food and peace, / builds the way into the united world. Germany is green for the future of Europe. / Europe will be green for the future of the world. / The world is green for the future of life. / The future of life is ecological and true. “Talkin’ India is a warning and hope giving New-Topical-Song in times of global change and crisis when we have to think and plan for the whole earth and the future of its people. India in this time has, due to its largeness, free access to an enormous amount of sun, wind, water, earth and tidal energy. India therefore can be the first comprehensive green technology and green economy continent of the world. India could build its future society on pollution free and renewable energy, and provide for its people and the world at large, immediately effective research into and realization of the only long term solution for secure food and energy production not threatened by otherwise inevitable food and energy wars approaching the earth in the near future. India on such a sound and future oriented ecological and economical basis would then be fit to avert from its democracy the dangers of growing corruption and loss of universal rights generated by wars and conflicts centered around dwindling oil, gas, uranium and other resources, as well as social tensions in the wake of climate change and the growing natural disasters it brings. of democracy and politics that can. but the vision of a continental green tomorrow. overcoming food and energy fears. and a democracy showing what it wants. 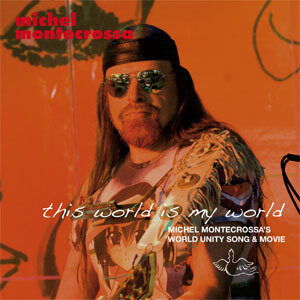 Living On A Planet is Michel Montecrossa’s great wildlife & biodiversity song-movie released by Filmaur Multimedia and Mira Sound Germany on DVD. 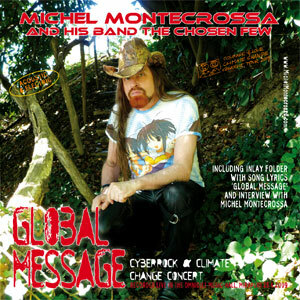 Michel Montecrossa‘s futurist courage & love climate change musical in two parts. 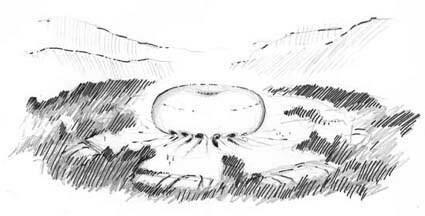 The House Of Time: a visionary sci-fi action thriller moving between earth and unbelievable sky-city. The futurist love-story of cyberwarrior Michel, his dream girls, Mystery, Hazel and the mysterious Lady from the Sun. 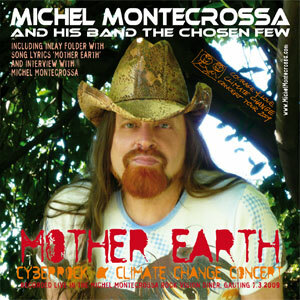 The video for Eco-ActivistMichel Montecrossa’s ‘5 Green Tomorrow Eco-Hits’ presenting five Michel Montecrossa Eco-Hits for the United Nations Climate Change Conference: ‘Green Tomorrow’, ‘Are You Gettin’ Ready?’, ‘Another World’, ‘Sunray Revolution’ and ‘Living On A Planet’. Green Earth, my darling, I love you. Green Earth , I love you, sweet and round. I love your beautiful rivers. no more is that happy girl. with poison into her clear air.There is something changin‘ her climate. O Lord! It‘s we and it‘s we who must change. Green Earth can do it all by her own. she can starve us straight to death. she can drown our falsehood-worlds.She can melt her ice. She can change her life. It‘s we who pay the price. and not war and stupid greed. Green Earth, you are so precious indeed.Green Earth is our home. Green Earth is where in future too we‘ll roam. Green Earth for our love. Green Earth, I love you, sweet and round. for tomorrow strong and sound. 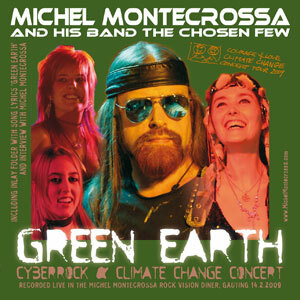 About ‘Climate Generation’ Michel Montecrossa says: “Climate Generation is the youth-movement of the 21st century. Climate Generation is born on a planet with a changing climate both inner and outer. Values collapse. It’s either food or housing – or none of them. Volcanos erupting, earthquakes, cyclones, wars and crimes increasing, energy dwindling, prices rising, drinking water fading as does work, slums expanding as does hopelessness. 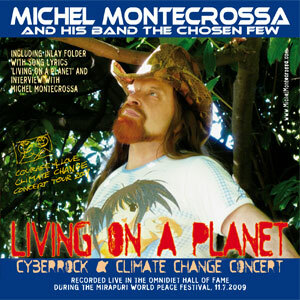 Michel Montecrossa says: “At the Spirit of Woodstock Festival 2009 in Mirapuri me and my band perform our 10 days ‘Alternative Future’ concert series. 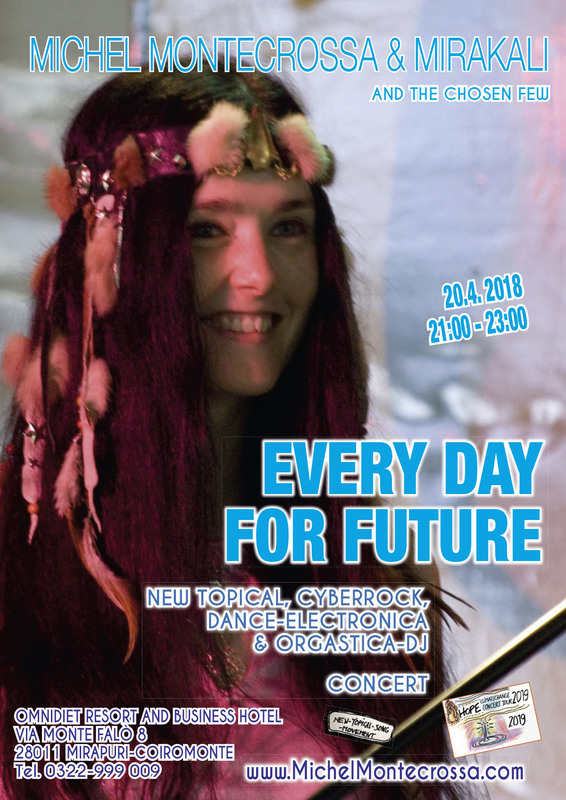 During these concerts we present topical songs dealing with the life on our rapidly changing earth and the impact these changes have on our future. 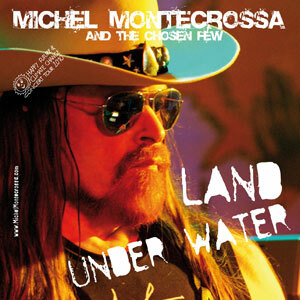 About ‘Another World’ Michel Montecrossa says: “When good things turn bad, what good comes from the bad? Is the green Greenland the good that comes from the melting ice? About ‘Light Energy’ Michel Montecrossa says: “The original light and the planetary light, the light of consciousness and the light of the sun is one light energy creating all. Songs can be light in the darkness when intelligence burns out. “There is an intimate relation between man’s soul and the earth. It is a right relation when it is conscious, harmonious and full of light. It is wrong and brings trouble when it is dark and distorted by greed and lies. The truth of a relation is determined by its intensity and wideness of love. 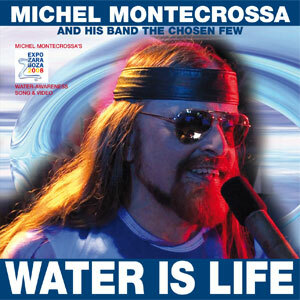 About ‘Wake Up’ Michel Montecrossa says: “All over the world writing and singing bring us songs that make us aware in larger ways, songs that are broadsides of consciousness. 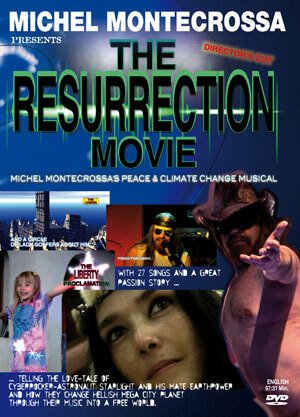 ‘Sunray Revolution’ presents 84 song-lyrics from Michel Montecrossa‘s legendary Peace & Climate Change Tour. Each song is featured with easy to learn guitar chord-progressions. 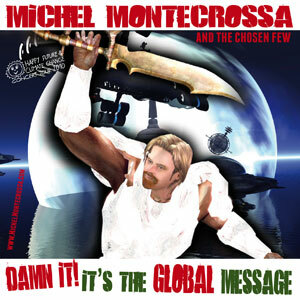 ‘Sunray Revolution’ is Michel Montecrossa’s proud and mind-shaking adventure into eco-world. The challenging questions of our future on a planet with dwindling resources, energy-wars and irreversible global warming are highlighted through straightforward and inspiring genius-songs. ‘Sunray Revolution’ not only raises questions but above all is leading to positive answers. ‘Sunray Revolution’ is joy and intelligence singing in 84 songs of our changing world and the way of peace and progress for a better future. 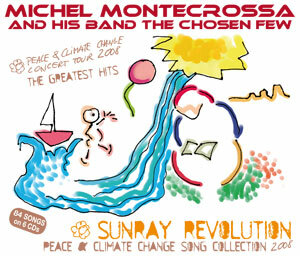 ‘Sunray Revolution’ is a masterpiece of songwriting by Michel Montecrossa, one of the 21st century’s greatest musician-artist. 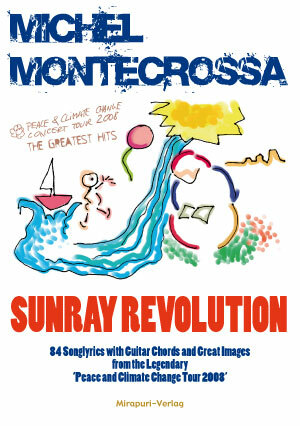 ‘Sunray Revolution’ unfolds its message on 212 pages with 84 song lyrics, photographs and guitar chords. 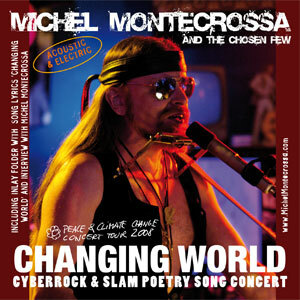 Michel Montecrossa’s great slam poetry earth and peace musical. 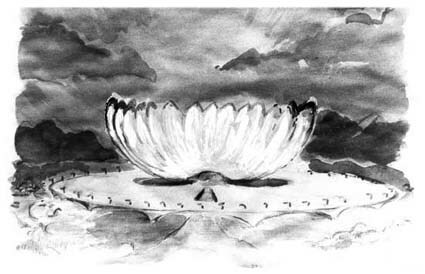 ‘The Invisible Wall’ is an orphic story looking through the many symbols and events of life to the reality behind. ‘The Invisible Wall’ tells the story of the Travelin’ Man who for some time has a job as king. Later he drops the job and experiences an existential revolution. It is the door to the reality of love and a new birth in consciousness. 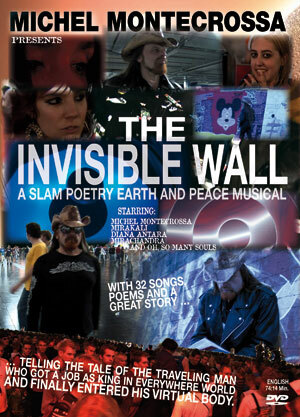 ‘The Invisible Wall’ is poetic music-cinema telling the story in a multidimensional way. Various roles express themselves through changing persons, thus creating a web of awareness reversals. Through this interactive play and journey of vision, poetry and music a virtual body appears which gives the clue to the deeper sense of reality: The sense of love bridging all divides, the sense of coming home, the sense of the true embrace that lasts forever. Future Mirapuri is a big garden, woods and a natural environment with platform-houses, earth-houses built inside steep slopes and tower like constructions.These architectural structures will need only very little groundspace so that the greater part of nature stays untouched and provides abundant, selfrenewing resources for the city: air, water, wind, solarenergy, natural recycling, agriculture. The means of transport are mainly horse-carriages, bicycles, cable railway, mountain railway and zeppelins for air transport. 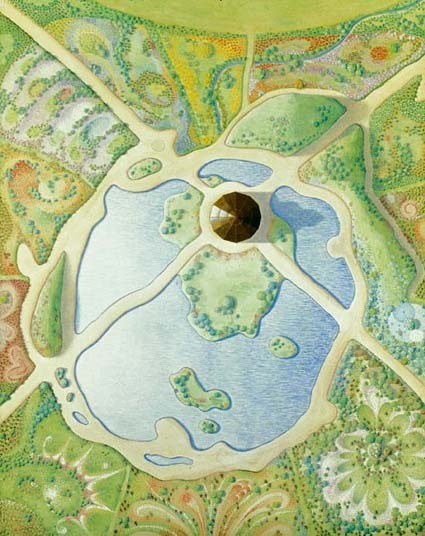 Miramandir: Design for the surrounding gardens and lake. Each of the 12 gardens is dedicated to a specific Power of Consciousness. The Residential Sector of Mirapuri is dedicated to the multivarious expression of beauty and harmonies of form. 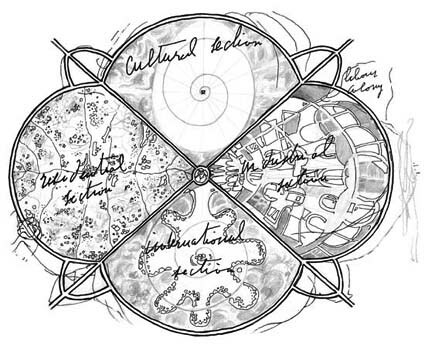 The Cultural Sector of Mirapuri is dedicated to art and science, far-reaching research projects and sport activities. The International Sector of Mirapuri is the place for pavillons presenting the true values of all cultures and civilisations. The Industrial Sector of Mirapuri is dedicated to the development of all talents and capacities to be an instrument of self-expression and perfection. Thus the four sectors of Mirapuri are related to four main parts of the human being: the Physical, the Vital, the Psychic and the Mental. 1. Application of forward-looking technologies in the fields of solar energy, energy storage, construction material, heating and cooling systems, solar generation of electricity as well as developing and implementing concepts for renovation and conversion of buildings.